Smarter Fitter Smoothies is all about how to make delicious healthy fruit and vegetable blends that will rock your world and make you feel awesome! This isn’t just a book for vegans; it’s for anyone who appreciates whole, natural ingredients in the food they eat. This makes my book perfect for anyone who’s dairy free, soy free, gluten free. 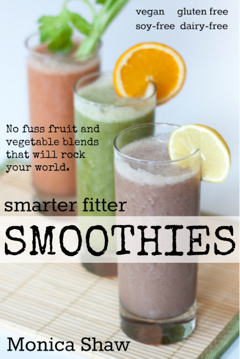 And for those of you folks seeking “paleo smoothies”, my book is full of them. It really is a smoothie book for everyone!